February and March 2018 saw the largest ever industrial action in the U.K.’s higher-education sector. 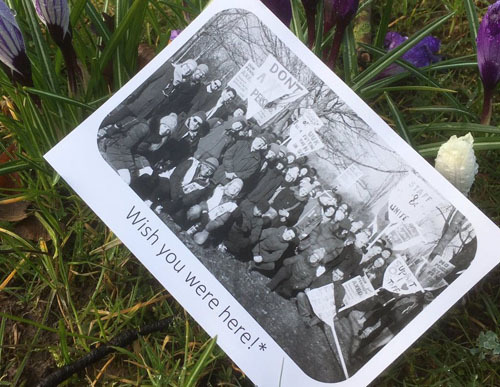 While the cause of the strike was changes to the USS pension scheme, the picket lines were sites for conversations about many other issues within academia. Whether it was dissatisfaction with the corporatization of universities, the precarious working conditions of early career researchers, or over-work, there was a clear sense that the values held by those striking were in sharp contrast with the realities of university life. The “depth of feeling” was often bitter and angry, and the frustration with today’s higher-education system was palpable. Figure 1. Schwartz's values model. Adapted from (Schwartz 2012). From the HCI community standpoint, a similar value tension was captured by a survey carried out as part of the “Values in Computing” (ViC) workshop at CHI 2017. With just over 150 respondents, the survey explored views about the values driving HCI research at a personal and institutional level. 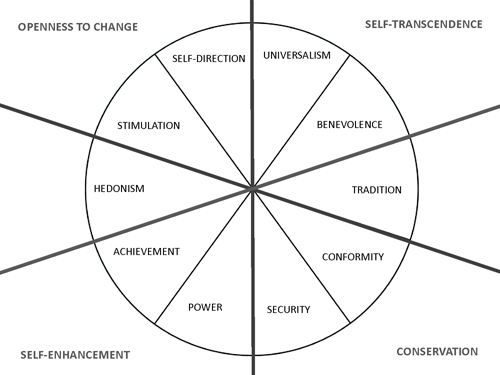 The survey was designed around Schwartz’s values model (Figure 1) and tried to capture relationships (i.e., lines of friction) within and between the personal and institutional values held by the HCI community. Although the survey was exploratory and the sample may not be representative of the whole HCI community, the numbers did show tensions within the community. Overall, most respondents felt their values matched their institution’s to some extent (57% of the respondents). However, almost a third reported that their values either did not match (26.5%) or did not match at all (6%). The survey also asked respondents to rank a list of options according to which were most highly valued in their work; this is where the values tensions became manifest. As the bar charts in Figure 2 show, the top three most highly ranked options were “making the world a better place”; “competence and intellectual independence”; and “relationships with colleagues, students. and partners.” These statements were designed to represent Universalism, Self-Direction, and Benevolence in Schwartz’s values model and followed previous research guidelines. Positive societal impact, autonomy of thought, and meaningful relationships were thus the things that these computing professionals most valued about their work. By contrast, financial recognition (Power) was the least valued. Figure 2. 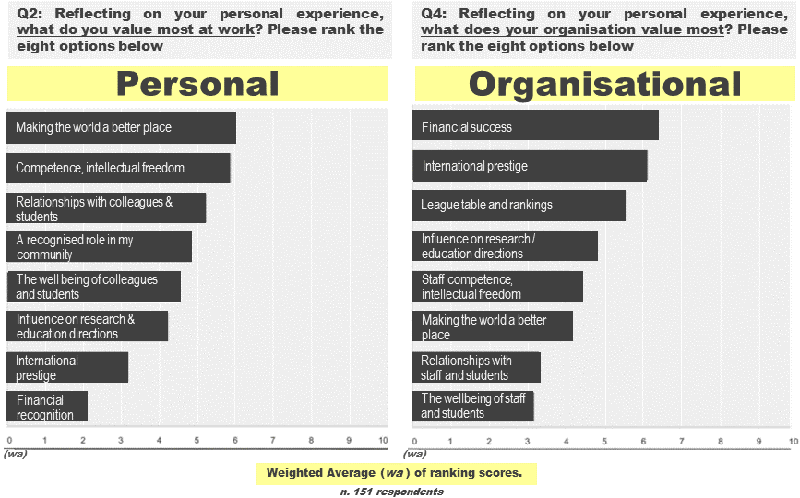 Personal and organizational values ranking. Respondents were then asked to rank a similar series of options according to what they thought their institution or organization most valued. They felt that their institution most highly valued “financial success,” “international prestige,” and “league tables/rankings.” All these three options belong to the Power values group. By contrast, the bottom three options were “making the world a better place through work, research and teaching,” “staff relationships with colleagues, students, and research/work partners,” and “supporting the well-being of staff, students, and partners.” Thus, the things that the respondents most valued—with the exception of intellectual autonomy—were seen to not be highly valued by their institutions. The implications of this friction between personal and perceived institutional values cannot be ignored and deserve further attention. Even if this tension may be, to a certain extent, “perceived” or “inevitable” or both, the widening of the values gap may have problematic consequences. For example, recent research and extensive media coverage worldwide suggest high levels of stress and mental health problems within academia. However, the emphasis of these studies is often on the temporal and mental burdens created by the demands of the workplace, and the need for raising awareness and promoting self-care (i.e., through apps and physical activity). Something that isn’t often talked about is whether the values tensions may have health and well-being implications, and the need for digging deep into the root causes of these tensions before defaulting to self-care coping mechanisms. This may be particularly the case in the HCI community, as many of us not only grapple with personal challenges, but also with the challenges of a much deeper and broader “existential crisis.” This is especially important because much of HCI research focuses on designing and developing digital technologies that can change people’s lives rather than examining how digital technologies come to life. We need to look into values tensions not only for the end-users and broader stakeholders, but for us—researchers, educators, designers, and developers. To this end, we argue that a better understanding of values is needed, especially when it comes to computing technologies. From a research and practice perspective, this means to build on, but also go beyond, the substantial corpus of research in ethics and the well-established research field of value sensitive design (VSD). Our question for the HCI and broader computing community is how to bring to the open the personal, institutional, and political values tensions manifesting in our workplaces (i.e., academia, research). In other words, how can we support the next generation of computing professionals with the deliberative, technical, and critical skills necessary to tell the difference between what is worth pursuing from what is potentially harmful to self and society? And how can we create and support institutions where this civic purpose can flourish? Team ViC is a research team with expertise in rapid prototyping, agile development and participatory action research. ViC core team is flexible and can quickly reconfigure to bring extra expertise and support from its research and industry partners. We have many years experience of working together and in partnership with communities, practitioners, and businesses in projects such as Catalyst and Clasp.